Yes, I know I am late getting this post up. Sorry! But in case you missed the announcement, Pattern Review celebrated 10 years this month, and several cities around the country hosted a PR Day get-together on November 19th. 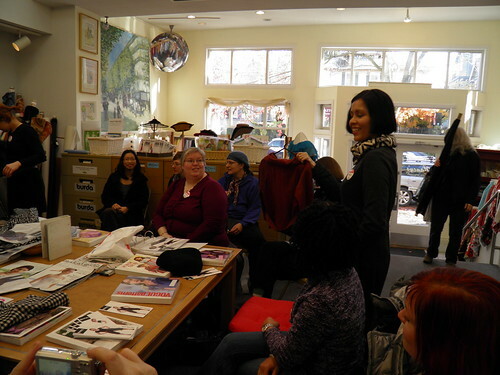 We were lucky enough to have someone step forward to organize one for Seattle – thanks for all your hard work, Jacqui (pretty lady standing in the pix above)! It was pretty much an all-day event, tho I was only able to hang out with my fellow sewing nerd friends in the morning. 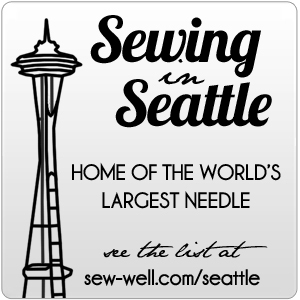 We started at Nancy’s Sewing Basket at the top of Queen Anne hill in Seattle. 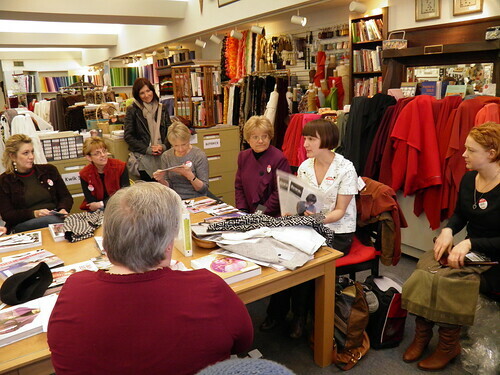 We were entertained and informed by two lovely young designers, Gina and Elizabeth, from SEWN Square One. In case you have not seen these patterns yet, you are definitely missing something. 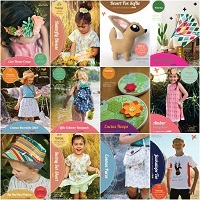 This new line is a division of Lorraine Torrence, and these patterns are very well-drafted, are fresh, modern designs, and have excellent instructions to boot. One of my students made the Go Anywhere Dress, which was designed by Gina. Adorable. Could successfully be made up in a wide variety of fabrics and be suitable for a range of occasions. 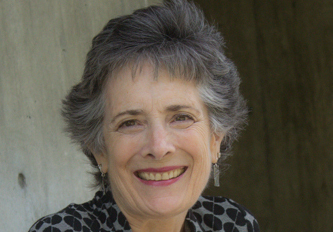 Of course, I had to purchase a couple of patterns on the spot – the Swing Shift which was designed by Elizabeth, and the Upline Jacket. I am going to make the Upline Jacket in an “ikat style” print denim I have in my stash, and I am not quite sure about the Swing Shift yet. I do have to say tho, it is so refreshing to see such hip, trendy YOUNG people interested in the art of sewing. These bright young designers definitely have their game on. Here Gina is holding some of the sample garments while Elizabeth is describing the design features. After learning more about SEWN Square One, I headed to lunch with a pal from ASG, and then sadly had to head home. The rest of the gang went on to Seattle Fabrics and Pacific Fabrics in Northgate. It was definitely a fun day, and I hope to attend more PR events in the future. If you are not a PR member, join us! Finally, the double torture is over. I finished the sleeve hems and added two more rows of topstitching to the bottom hem, and decided to call this one good. I DO think it is cute, and it was warm and cozy last night when I wore it to my Bellevue neighborhood group ASG meeting. And let’s just say I am glad it is out of my sewing room. Really glad. I will definitely think twice before buying double-cloth that needs to be separated again! And now on to the next adventure —twin sets! I seem to have (ahem) collected a bit of sweater knit fabric. And to think I was considering buying some at Pacific Fabrics the other day! No doubt there is a purchase in my future, but first I am going to make up a few shells and cardigans using the Loes Hinse twin set pattern. I am in the mood for something simple and fun, and this exactly fits the bill. Thank goodness. 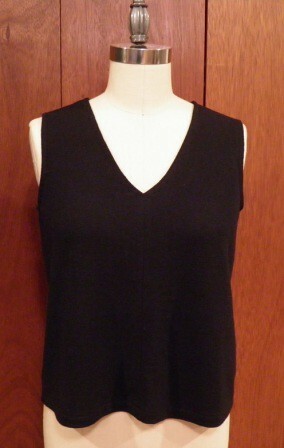 All done except hemming the sleeves. All I can say is it is a good thing I love the coat, because I truly hated working with this fabric. Seriously hated it. Enough to consider pitching it a couple of times during construction. 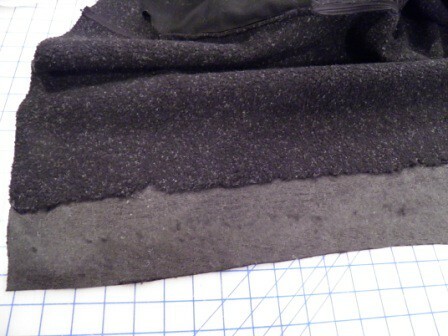 Separating the fleece from the nylon was no darn fun at all. My DH was able to rip it apart pretty easily, but I just don’t have the hand strength for that. 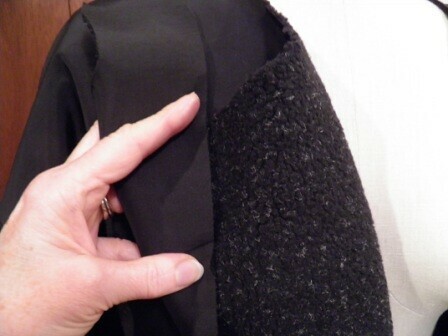 And there was just too much bulk to retain the fleece in the front facings and hem edges — it had to go. I used a razor blade to help set the fold line, and ripped the balance after my DH got it started. See how weird the naked front facing looks? Gotta love that perfectly straight edge, huh? Did I mention how easy it is to cut thru the nylon when using a razor blade? Umm, yeah. 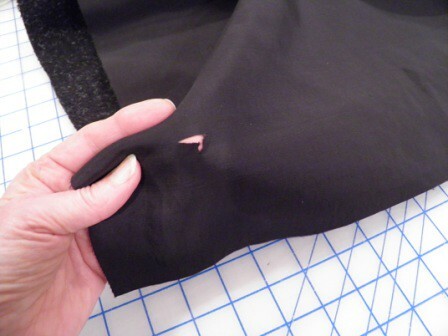 I tried mending the holes (yes, holes — I definitely made more than 1!) 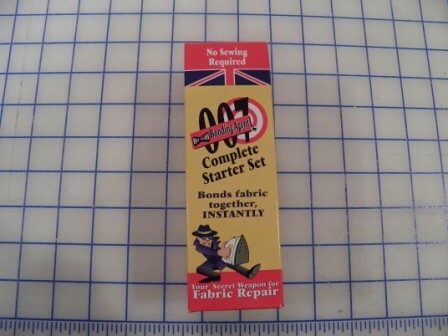 with fusible interfacing and fusible stay tape. No love from either of these products. Luckily, the 007 Bonding Agent did the trick. It is one big pain to apply neatly, but I repaired my damage and didn’t make it look worse. Always a plus. 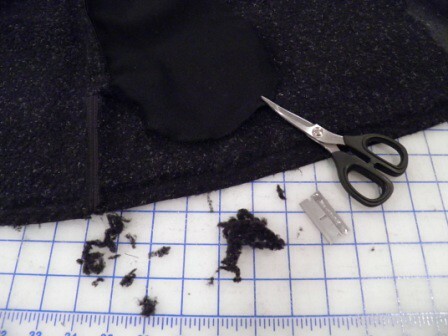 For the hem edge, I cut off the bulk of the fleece I wanted to remove with my curved blade Kai scissors, and then scraped a little more off with the razor blade. Not a bad result, but definitely tedious.At least I managed to not add any more holes. Sooo glad this project is almost done. 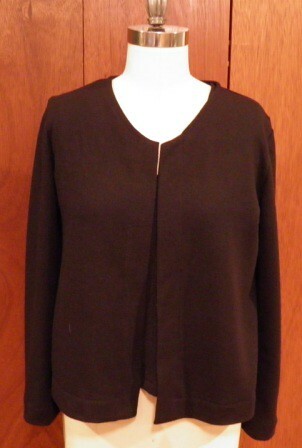 I think if it ages in the closet for a while I will enjoy wearing it…hopefully! I am not sure what I got myself into. 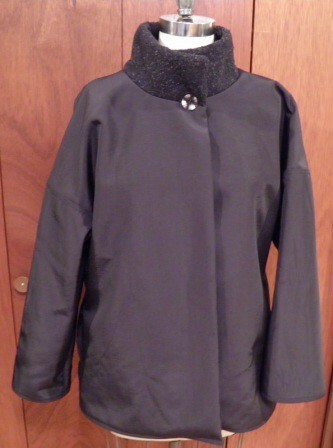 <More than> a year ago I bought some fabric at SewExpo because I thought it was super cool, AND because I thought it would make such a distinctive coat for our rainy PNW days. The fabric is double cloth – one side is a slightly heathered, black sherpa fleece, and the other side is a water repellent <probably> nylon. Have you ever sewn with double cloth? I thought it would be really easy to whip up a coat with simple design lines, but evidently I know how to make any project more complicated. 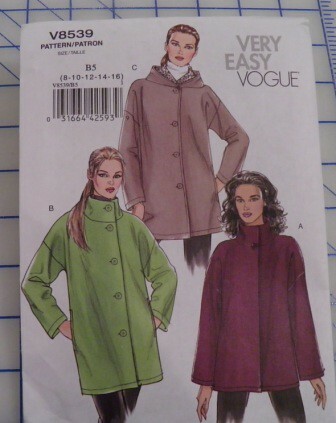 The pattern is simple enough — Vogue 8539 —and I am making View A so no buttonholes or hood. Simple, right? 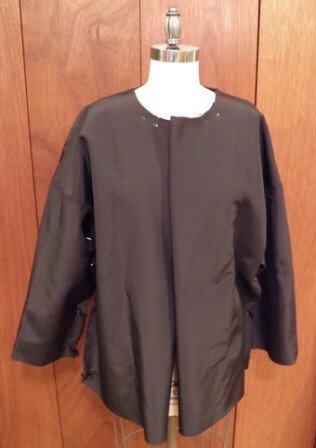 Here is the coat so far – shoulder seams stitched, back darts done, and sleeves attached. Next up are side seam pockets and then the collar. 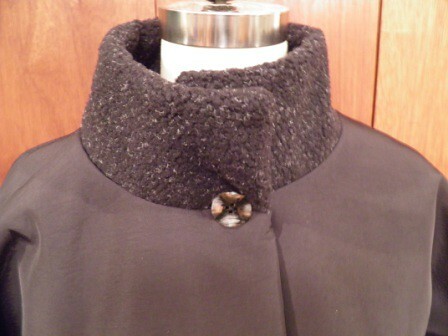 I plan on making the collar fleece side out so it feels warm and soft against my neck. And I am going to have a AWESOME time cutting all that fleece off the front facing turnback. Why did I think this was going to be a fun project? Oye!! I was looking for a good (read “inexpensive”) source for interfacing, and a local sewing guru suggested I check out Metro Textiles at 265 West 37th. This place is a little hard to find – it is on the 9th floor and around to the back of the building – but is definitely worth a stop if you are shopping for bargains. The owner’s name is Kashi, and he is delightful and more than happy to help. I saw loads of fabrics that I COULD have bought, but I managed to stick (mostly) to my plan for checking out his interfacing prices and quality. A couple of pretty knits did sneak their way into my bag….but that is hardly worth mentioning. Hardly at all. Who can visit NYC and NOT stop at Mood? It is my go-to place for best all-round fabric selection—they really do have everything. I am currently obsessed with Japanese selvedge denim, and after buying some in the LA Mood this summer, I had to make a similar purchase from the NY location. No, I haven’t sewn up the piece I bought in LA yet. So what’s your point? Fabrics need to rest after they have traveled around the world, and I thought the LA piece needed a companion from NY. Before being cut up into little pieces and re-assembled into something fantastic, which when you think about it must be quite a shocking experience. Even for denim. Continuing on my selvedge denim obsession, I also stopped at A.K. Corp which is located at 257 West 39th, and bought another similar but different companion piece. It was MUCH cheaper than the denim I bought at Mood, still has the bound selvedge edge, and is a bit lighter weight and darker wash. It looks to me like the piece from Mood is woven with both indigo and natural threads, and the piece from A.K. Corp is comprised of only indigo threads. They are currently both in the laundry, and I am interested to see how they wash up so I can do a more thorough comparison. I made a quick stop at the Paron Annex at 206 West 40th – they have some faaaaan-tastic bargains in their 50% off selection. But by this time both my DD and I were getting tired, intermittently soaked by heavy rains, and we still had one more stop to pick up some silk charmeuse for a bridal accessory customer….which means we did not give Paron’s sufficient attention. But this place is a definite must-visit for the next trip. Another thing I did not get done this trip was finding a good source for “findings”. 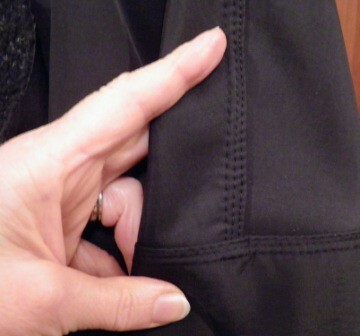 Things like zippers and waistband stabilizer. There are so many sourcesto explore in New York….but I just couldn’t drag my eight-month pregnant DD around in the rain ALL day. Next time!